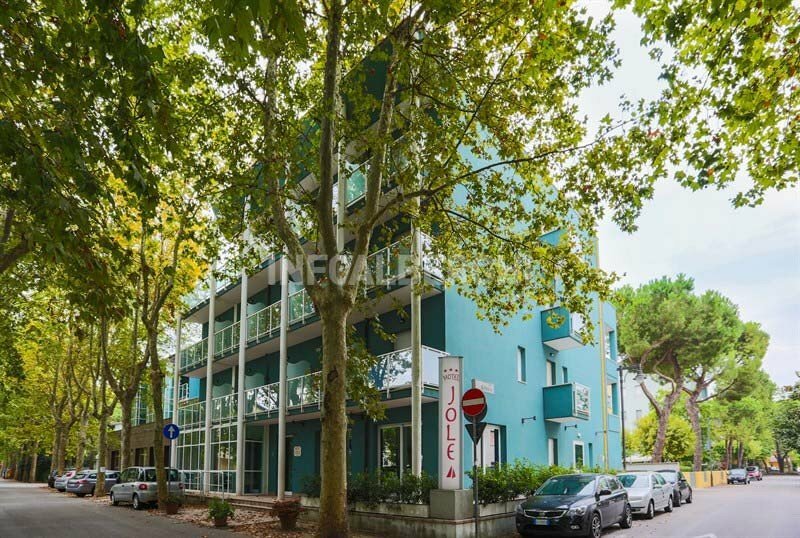 The Hotel Jole in Cesenatico is a three star superior hotel that has parking, WI-FI connection, rooms with balcony and air conditioning, disabled facilities, baby club and games for children. Small pets are allowed. The hotel is just a few minutes walk from the beach of Cesenatico. Even the historical center and the long canal, just over a kilometer, can be reached quickly. The hotel has 47 comfortable rooms, all equipped with: balcony, air conditioning, TV, mini bar, telephone, safe and private bathroom with shower and hairdryer. Breakfast in the room for a fee. FAMILIES: Junior Suites and connecting rooms are available. Garden, sun terrace, bicycles available, bar, TV room, reading room, lift, theme nights. PARKING: uncovered and free (12 parking spaces available). CONVENTIONS: beach, swimming pool, waterslide, organized excursions. SERVICES FOR PEOPLE WITH DISABILITIES: entrance on the ground floor with a sloped ramp, a lift for disabled people, rooms with wheelchair maneuvering space and a bathroom with an accessible shower and a chair. LUNCH AND DINNER: choice menu with three first and three seconds. Homemade pasta and meat and fish dishes every day and buffet. In hotel: 4 strollers, live entertainment, bicycles with child seats, indoor playground area, mini club, baby sitter and pediatrician available on request and for a fee. At meals: flexible hours, baby seats, baby menu and baby food. The hotel has an agreement with Bagno Zara n. 23, which offers, among its services: live entertainment, playgrounds and games for children. List prices are for a min. 3 days and is not valid for public holidays - bridges - fairs and events. Book your holiday in advance .. and save! Book your holiday by April 30th 2019 in All Inclusive Formula for a minimum stay of 7 days! With the advance booking you will receive a discount of -15% on the list price, paying a deposit of 50%.